Oscar Pistorius Seeks Redemption In Race To Be The World's Fastest Amputee : The Two-Way At the Paralympics, the South African double amputee faces his rivals in the 100-meter sprint. 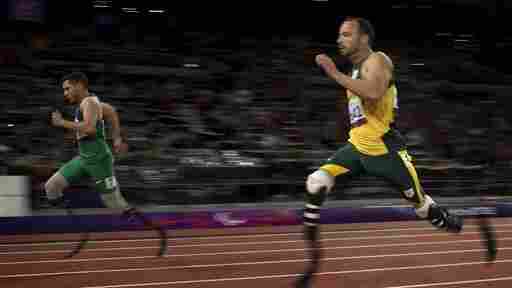 One of the best stories of the London Olympics was Oscar Pistorius running for South Africa on his prosthetic legs. His fight to make the Olympic team brought new attention to sports for people with disabilities. And the attention also brought new competitors — who now are vying with Pistorius to claim the title of world's fastest amputee. Now Pistorius is back in London for the Paralympics, and it's been a rocky start for the 25-year-old. In his first race, the 200 meters, Pistorius held a comfortable lead until 20-year-old Brazilian Alan Fonteles Cardoso Oliveira emerged from the pack to win the race. The crowd, which had been wildly cheering for fan-favorite Pistorius, was stunned into silence. It's worth checking out the video from the International Paralympic Committee, just to see Oliveira zoom ahead, looking like the Road Runner passing Wile E. Coyote. You can also hear the surprised TV announcers. After the race, Pistorius complained that Oliveira had an unfair advantage because the height of his new prosthetic running blades added to his stride. There was irony in this, because international sports authorities have debated whether Pistorius' own prosthetic legs gave him an unfair advantage over nondisabled runners. Officials for the International Paralympic Committee said Oliveira's blades were within regulations, but they said they would review the rules that determine the length of the prosthetics. Tomorrow, Pistorius will get a chance at redemption. He's expected to run for the gold medal in the 100-meter sprint. Traditionally, the winner of this race can claim the title of world's fastest amputee. Jerome Singleton, a single amputee, will challenge Oscar Pistorius in the Paralympic 100-meter race. Pistorius has won the 100-meter sprint in the past; he shares the world record for a double amputee. But he narrowly lost his last international competition in the event, at the 2011 World Games in New Zealand. It was Pistorius' first loss in seven years. The winner was American single amputee Jerome Singleton, in a photo finish. Singleton, who had been a runner-up to Pistorius in the past, thinks of the South African as a role model who won attention for his sport. But Singleton, 26, also relishes their rivalry. "Muhammad Ali had Joe Frazier. Magic Johnson had Larry Bird," he says. "So Oscar Pistorius has Jerome Singleton." 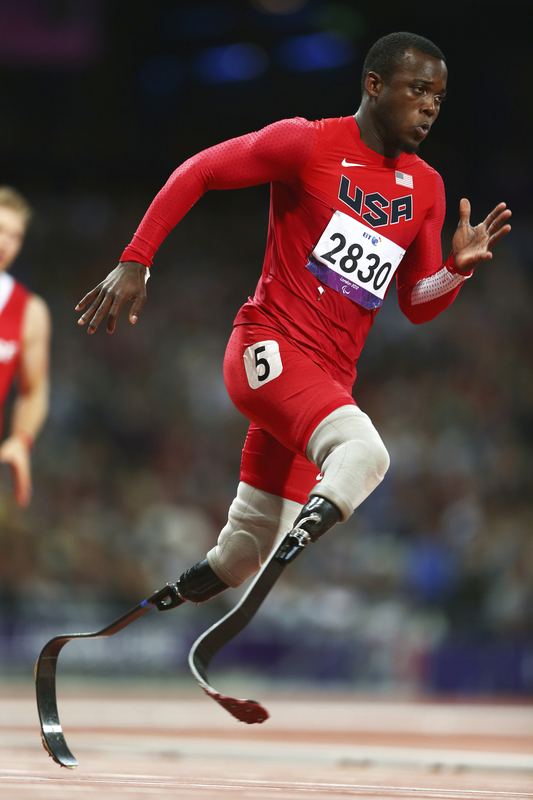 Pistorius and American Blake Leeper, seen here, share the fastest time for a double amputee in the 100-meter sprint. There's a lot more competition, too. 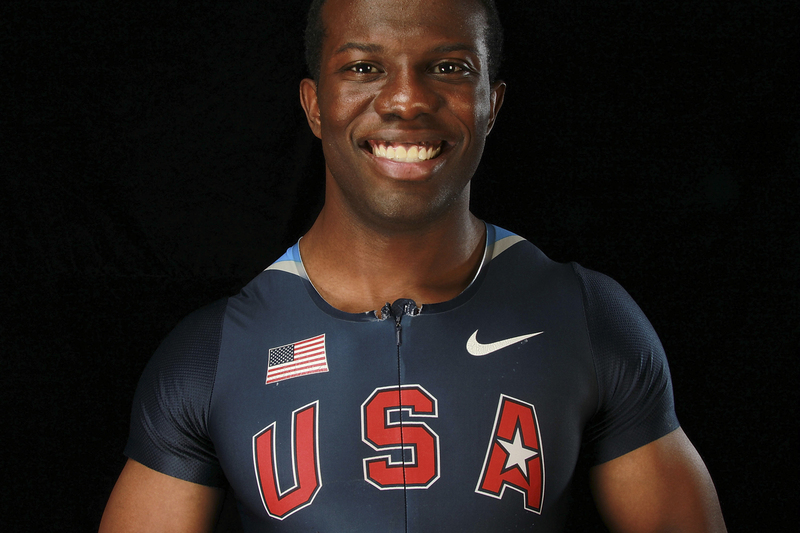 These guys have great names: there's Singleton, the single amputee, and Blake Leeper, the American double amputee who runs on two bouncy prosthetic legs. Leeper shares, with Pistorius, the fastest time for a double amputee in the 100-meter sprint. Leeper, 22, didn't know about the world track competitions until he saw a news story three years ago about Pistorius. And then there's Jonnie Peacock of Great Britain, who set a new world record in the 100 meters back in July. And, of course, there's the now known Brazilian, Oliveira. All of them have a chance to beat Pistorius. Or, the winner could be another unheralded runner who stuns the crowd to silence. "It's such a quick race. It's at a point where anybody can win," says Leeper. "I think that's why everybody likes the 100-meter race. It's hard to dominate the 100 meters." In world competitions, double and single amputees run together. And that leads to a friendly controversy over who's got the advantage: a runner with one prosthetic leg or two. 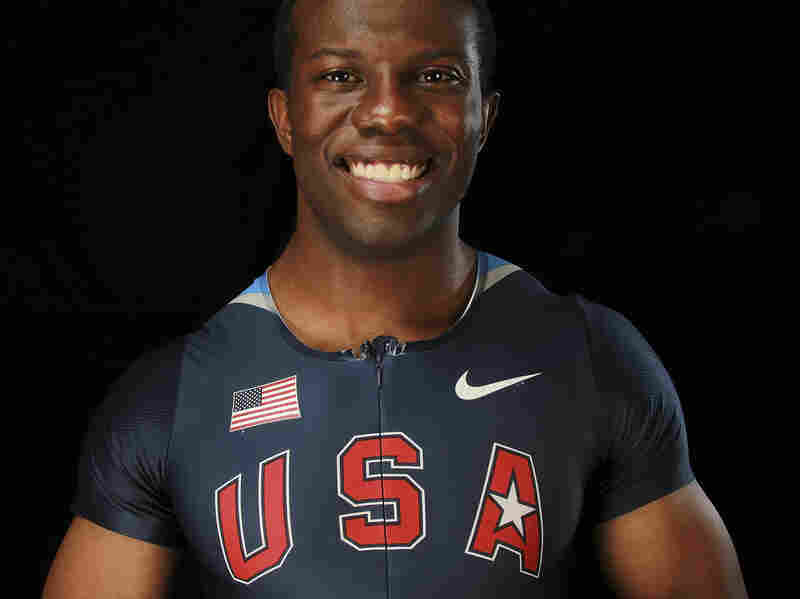 Singleton — who has degrees from Morehouse College and the University of Michigan in applied physics and industrial engineering — explains that single-leg amputees like him generate more force out of the blocks. But when the double amputees "get up tall and start running, they're blessed to be symmetrical," he says, and they can "have a smoother gait and be in control a little better." So that's one prediction: The single-leg amputees start faster out of the blocks. But watch out for the double amputees, who may have better balance, and a faster finish. Joseph Shapiro is a correspondent with NPR News Investigations. He recently wrote about Tatyana McFadden, an American athlete competing at the Paralympic Games. He reports frequently on people with disabilities.